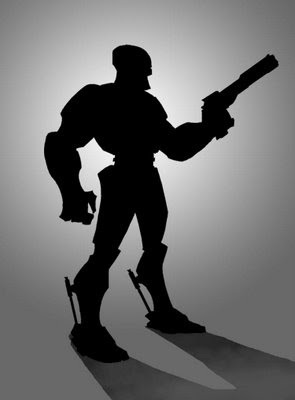 Chris Carman: Guess the Silhouette!!! hint: it's not Albert.....or is it??????? I'll post the finish in a few. i believe somebodies been doodling themselves some Robocop ?! haha! totally Robocop haha, can't wait to see the finished. i checked out you blog , great stuff on here!!! You should replace Peter Weller's face with Albert's. ooh ooh ooh Robocop! can't wait to see it. The silhouette looks great! Easy one- Robocop! First thing that popped into my head before I even read your post. Alright, now show that frickin' thing, or did you just draw a silhouette. Hey man i think I met you last wondercon when you had that table with niclolas. My names Fabian and Im a grad student at the academy I just wanted to say that I really dig your stuff and let you know that i added you link to my blog. Peace man! this could turn into a cool game dude!